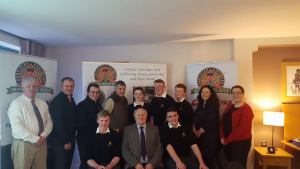 Five transition year students from Coláiste Phobal Ros Cré have advanced to the final of the Certified Irish Angus Beef School Competition 2018. The final will take place in Croke Park on Wednesday the 14th of March. This is a fantastic achievement for students, Geoffrey Drought, James Dooley, Craig Lally, Tomás Teehan and Jack Flannery. The students have been working on the project since September and qualified from rounds one and two. This is the second time our school has reached the final stage of the competition and the previous finalists, Roddy Teehan, Jack Bourke, Neil Maher and Jake Delaney have helped with preparing the team. Many thanks to Jake Delaney who has acted as a mentor to the team. The competition is run by the Irish Angus Producer Group along with its processing partners A.B.P. Ireland and Kepak Group. The competition is going from strength to strength every year. Well done also to the students’ teacher Mr Smyth for all of his support. Best of luck to the group in the final in March. 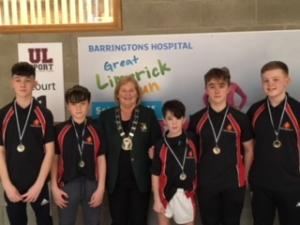 On Monday the 15th of January the school’s county badminton championships were held in Templemore, Coláiste Phobal had six teams competing in total. One U14, two U16 and three U19 teams, both the U16 and U19 teams were unsuccessful with the U19A team narrowly missing out on second. However, there was brighter news for the U14 team, they played Our Lady’s Templemore in a straight final. Scott Kelly and Jake Thompson won their singles convincingly to take a 2-0 lead, Jamie Conlon also won his single in a hard fought battle to make the score 3-0. Devin Loughnane in the last singles could claim the title but the men from Roscrea would have to wait as he was unlucky to lose a tight contest, Scott and Devin played the first doubles and this time made no mistake winning well to take the title, Jake and Jamie also took the last game to leave the result in no doubt winning the match 5-1. The following week they would compete in the Munster championships with Cork, Kerry and Clare competing. Roscrea played a strong Cork team first and were well beaten on a 6-0 score line. 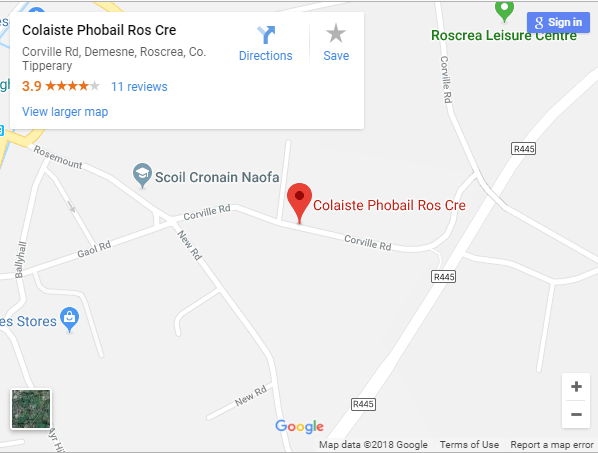 Clare were next and the men from Roscrea showed mental toughness to bounce back to draw 3-3, this meant second place was up for grabs. The final game against Kerry saw the best performance of the day from all four, 2-2 after the singles a huge effort in the doubles sealed a 4-2 victory and second place overall by one point.